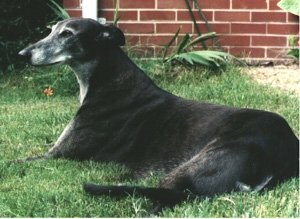 Imagine an old Greyhound whose racing days are long past. He is still elegant and regal, if slower and less sure of his step. His face is graying, and his eyes are not quite so bright as they once were, but he is the gentleman of the household and still master of his domain. He is loved and loving. His people would do anything for him to make the latter days of his life as comfortable and enjoyable as possible. He wakes up one morning and notices he is wet. He soon realizes that he is damp with his own urine; somehow this must have happened during his sleep. He is embarrassed and tries to clean himself up. His people are a bit worried and take him to see the veterinarian. She examines him and finds that his blood values and urine are normal; there are no infections or diseases. But he is a dog getting on in years and his hindquarters are weakening due to spinal problems. The loss of nerve function in the back half of his body is affecting the sphincter muscle that holds closed the urethra (the tube via which urine passes to the outside); it no longer has the tone it once did. So when the old gentleman is relaxing or sleeping, some urine slips by. She prescribes medication for him, and within a few days the problem resolves. Now imagine a middle-aged Greyhound, this time a female. She may have gone straight into a home after her retirement from racing, or perhaps she was bred for a while first. She was spayed — maybe years ago, maybe just weeks ago. Suddenly the same problem appears — lack of muscle tone in the urethral sphincter. But this time it is due to the lack of female hormones, and the medication prescribed for the old gentleman is not working very well for the female, so the veterinarian prescribes something different. Within a short time the female Greyhound is back to normal as well. What are these medications and how do they work? PPA works by increasing the release of a neurotransmitter called norepinephrine. This chemical stimulates the dog’s involuntary nervous system, tightening up the sphincter muscle that controls the flow of urine out of the body. It may also increase heart rate and blood pressure. In some cases, it may suppress the appetite and cause restlessness due to increased central nervous system activity. A typical dose would be 0.5 to 1 milligram per pound every eight to twelve hours, depending on which dosing schedule your veterinarian uses. 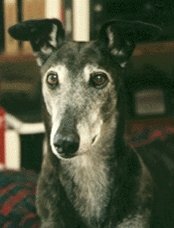 Because Greyhounds tend to be sensitive to medications, a smaller, less frequent dose is often enough. It will take several days to see the desired effect. If your hound shows any signs of nervousness or restlessness, contact your veterinarian for advice on adjusting the dose. While PPA is considered quite safe to use in dogs for this purpose, it can interact adversely with other medications, particularly the drugs known as monoamine oxidase inhibitors (MAOIs). Monoamine oxidase is an enzyme that helps to metabolize neurotransmitters, and combining this type of medication with one like PPA that encourages release of a neurotransmitter can result in high blood pressure and heart rate. Examples of MAOIs that may be given to a dog include Anipryl (selegiline hydrochloride, also commonly called l-deprenyl, Pfizer, Inc.), which is used to treat Cushing’s disease and cognitive dysfunction; the external tick and mite treatment amitraz, which is available as both a dip (Mitaban Liquid Concentrate, Pharmcia Animal Health) and in a tick collar (Preventic collar, Virbac Corp). Tricyclic antidepressant agents, such as Elavil (amitriptyline, AstraZeneca Pharmaceuticals) or Clomicalm (clomipramine, Novartis Animal Health, U.S. Inc.) should not be used in combination with PPA for the same reason. Even some non-steroidal anti-inflammatory agents such as aspirin can increase blood pressure in a dog taking PPA, so speak with your veterinarian about what you can and cannot give your dog while he or she is on this medication. PPA should be given cautiously or not at all to dogs with certain health conditions such as glaucoma, diabetes, and heart problems. PPA is considered the first drug of choice for incontinence caused by lack of muscle tone in the urethral sphincter, but in some females it is not sufficient. In those cases, the veterinarian may prescribe a female hormone called diethylstilbestrol, better known as DES. This drug was taken off the market for humans when it was discovered that it causes birth defects in children (its main use was to prevent miscarriage in pregnant women). Because of this, DES usually needs to be made at a compounding pharmacy. The dose will be between 0.1 and 1 milligram once a day for the first 3 to 5 days, and then 1 milligram per week thereafter. Smaller weekly doses may also be tried in order to determine the smallest possible effective dose. DES has one serious side effect that must be considered. Estrogens can be toxic to the bone marrow in dogs and thus cause blood diseases, resulting in low red cells, low white cells and/or low platelet count in dogs taking it on a chronic basis. Older dogs are more susceptible to this adverse effect. In severe cases the bone marrow may not regenerate even after withdrawal of the drug. Therefore, DES is generally not used unless absolutely necessary. A dog on long-term DES should have regular blood tests to evaluate the drug’s effect on blood counts. You may wonder if neutered males can end up with incontinence due to lack of testosterone. They can, but males are not as commonly affected as spayed females. PPA alone will usually resolve the problem for a male; in some cases testosterone is used in conjunction with PPA, but this is not common, since the male hormone can only be given by injection. Depending on the type of testosterone used, injections may be necessary as often as every two or three days or as infrequently as once a month. Adverse effects are uncommon but can include prostate disorders and behavior changes. Incontinence has many causes, from diabetes, Cushing’s disease, and kidney failure to bladder stones and even malformation of the “plumbing” that makes up a dog’s urinary tract. Have your dog thoroughly examined by a veterinarian before administering any medication. Giving your vet a thorough explanation of what’s happening with your dog will help greatly in determining the source of the problem. A dry hound is a happy hound and makes for a very happy owner, too! The Pill Book Guide to Medication for Your Dog and Cat, by Kate A. W. Roby, VMD, and Lenny Southam, DVM; Bantam Books, 1998. Veterinary Drug Handbook, Third Edition, by Donald C. Plumb, Pharm.D. ; Iowa State University Press, Ames, Iowa, 1999.